Starta gives you the resources to effectively communicate your needs or to support the needs of others. With a customizable Customer Relationship Management (CRM) tool, your organization can track any information regarding any person or organization. The system allows you to manage agreements, corporate documents, marketing materials, and more for all of your partners as well as for yourself. Authorized staff members may create custom flags to identify specific people for future newsletters, conferences or other notifications. 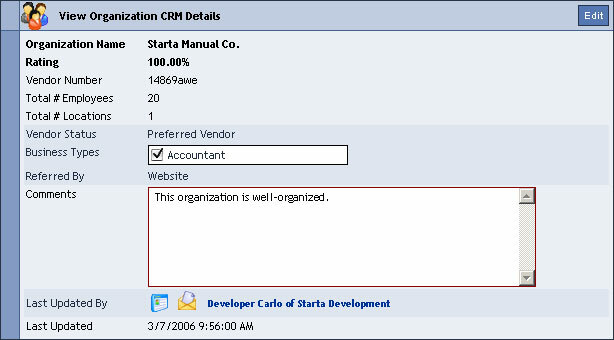 Starta's CRM tool tracks events and future activities to help you maintain a productive relationship with the people and organizations that you work with. Your organization's success depends on your team's ability to communicate with others. Starta provides the means to communicate prompty and accurately. Extend the power of our central directory system with this tool. Our CRM system lets you track data that is private to your organization about anyone or any company. You can define an unlimited number of custom fields for use at the organization or at the individual level, and can also take advantage of our Journal feature at both levels. Using CRM, you can rate organizations, quickly build vendor lists, tag people with custom flags to quickly create mailing lists, and store and retrieve organization documents using all of the features of our Document Managment solution. A journal is very much like a message board where people can leave notes to themselves, to others in their organization, or for everyone to see. Responses to an entry can be made, and tracking these responses can be useful for following things such as sales and support incidents, site visits for properties, and loan default remediation. This feature allows people to request feedback from participants on a project. You specify the topic plus any special instructions or requests, and specify who you want feedback from. This feature can even be used to solicit comments from entire departments or working groups. For example, you can easily float a grant application through other departments of your business before committing funding. Keep track of members of projects individually, or by working group "teams." Control which participants have access to what functions and documents based on a powerful role and task based security model. 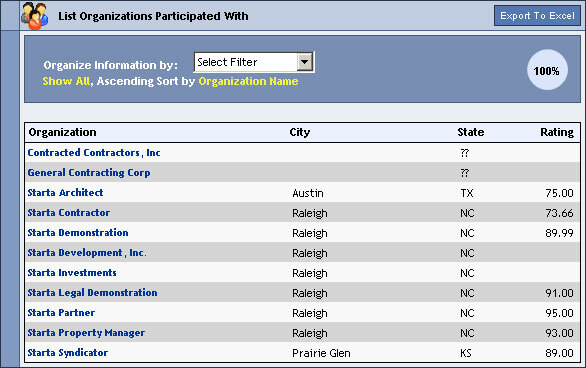 Easily create mailing lists from all or a subset of all of your participants on a particular project. Central lists of organizations and people you work with are automatically built as you add participants to each of your individual projects. All of the individuals and organizations within Starta are part of a central directory service maintained by Starta. This makes for consolidated access, so that a person only ever has a single login name and password to the system, and can then access any projects or other functionality to which they have been granted access. This also makes it so that a person's contact information only has to be defined and maintained once, and updates can easily be shared with all. We're Always Adding New Features! In our commitment to serve all our clients, our system is always expanding. We try to keep our feature lists up to date, but there is a good chance that there are a number of features that are not listed here. For a full feature list, please contact us. Test drive Starta with our free, no obligation account demonstration. In the demo environment you can try our platinum core services along with sample data and reports. Starta Development does not sell, license, or rent any individually identifiable information about you to any third party without your consent and will protect the individually identifiable information you provide to us.